You may have to teach your furry pal where to go. Three-week-old kittens are too young to be away from their mom, but in some cases the mama may abandon her young and you'll have to take over. At three weeks, your fuzzy pal may be too little to use the litter box on his own. You'll have to train him. Kittens learn to eliminate from their mom. From birth and up through the first several week of life, a young mother licks the rear ends of her kittens to stimulate their bowels, giving them the need to "go." She also licks her babies' hindquarters to clean them after they relieve themselves. While a 3-week-old kitten may be fully capable of using the potty on his own, he might not quite have the gist of it yet. If he isn't relieving himself, simply get a warm wet wash cloth and rub the area below his tail. This mimics the licking motion his mom does and helps signal to his brain that it is time to "go." Rub his rear area for a few seconds and then place him in the litter box. Young felines often have to use the potty after intense play or after eating a big meal, says the Humane Society of Utah. These may be the best times to stimulate his body to use the litter box. A 3-week-old kitten is very small, so you'll need to get a litter box he can comfortably get in and out of with ease. The walls should be short or it should at least have one wall that is low enough for him to maneuver his way around. Avoid setting up the potty area in a high-traffic or noisy room, such as the bathroom or laundry room. Your fuzzy buddy may become frightened and be less inclined to use his designated toilet area. 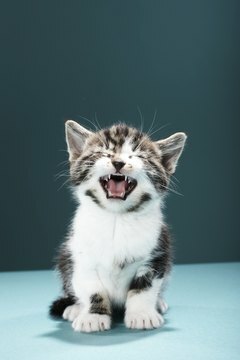 Usually by five or six weeks of age, kittens become fully potty trained and do not need stimulation to relieve themselves, explains the Feline Advisory Board. Cats often become accustomed to a certain type of litter from an early age and prefer the same litter throughout their lives. However, not all cats are finicky and some will use any kind of litter you put in the box. Start off with an unscented regular clay litter or shredded newspaper while your new fuzzy family member is learning where to potty. Kittens are often curious and may sample from the litter box to see what it is. Clumping or heavily scented litter can cause problems in his fragile little digestive tract and should be avoided in the beginning. Always go with your veterinarian's recommendation since your specific situation may be special.